As this year's elections approach, the eyes of the nation are turning to Charlotte. With the Democratic National Convention expected to bring in at least 30,000 delegates, service industry folks know it's their time to shine. People making the pilgrimage will no doubt want their share of Southern fare, and thanks to three new Queen City restaurants, they won't have to travel far to get it. Uptown, once a hot spot for busy bankers by day and practically a ghost town by night, has morphed into an entertainment destination for both locals and out-of-towners alike. Although its food scene is mostly known for high-priced haute cuisine, more approachable and authentically Charlottean options do exist. The recently opened Queen City Q (225 E. 6th St.; 704-334-8437) is one of them. Seasoned restaurateur John Duncan, notable for his involvement with Bonterra and Mac's Speed Shop, is also behind the development of Queen City Q. "I like to say that first I find the location, and then I think about what to serve there," says Duncan. "It depends on what the market calls for." Noticing Uptown's lack of options for 'cue, Duncan and his team knew they'd found their niche. "There really wasn't BBQ downtown; Mert's was doing a little bit, but not anything like what we were talking about doing. We thought we'd let Mac's be the biker bar, blue jeans and T-shirts hangout place, while we're maybe the blue jeans and polo shirt kind of place." Queen City Q caters to fans of both NC and SC style BBQ, offering homemade sauces served on the side and allowing customers to eat the 'cue that suits their mood. The recipes come courtesy of pit master Dan "Boone" Gibson, who worked at Bonterra with Duncan for years prior. "Boone's always done BBQ as a hobby, cooking with his family on weekends and the 4th of July. He created all those recipes with his family, and we used their names on some menu items." Duncan's opinion on the future of Charlotte cuisine? "I think everybody wants to show the city off during the DNC, really show off what we've achieved here. You know, Charleston is one of the best culinary destinations in the world now, but they had to go through a renaissance; it wasn't that way 20 years ago. I think at some point, Charlotte could turn into just that." Sometimes in looking to the future, it serves us well to remember the past. 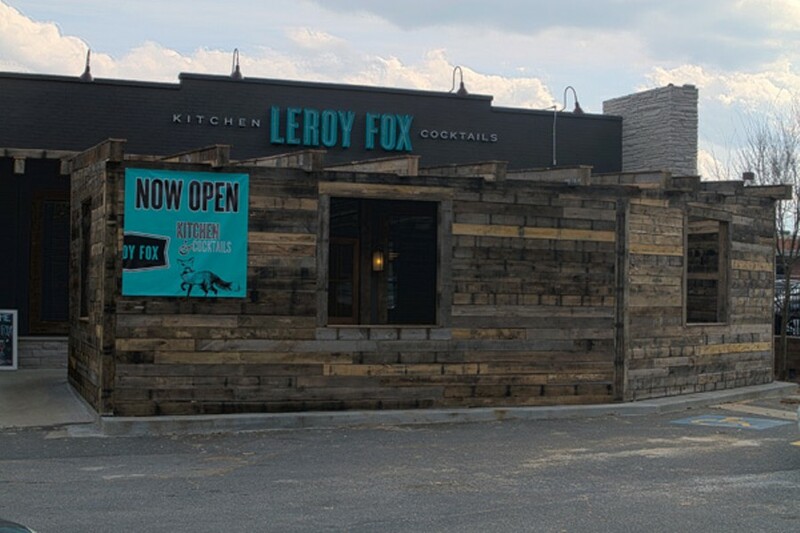 Leroy Fox (705 S. Sharon Amity Road; 704-366-3232), taking the place of the defunct Hotel Charlotte, is literally working the past into the present. Manager Brandon Foster knew the new joint had big shoes to fill, and so the landmark eatery's legacy is omnipresent, with vintage photographs on the walls and the original doors still intact. "If you look at Charlotte as a whole, the culinary scene has grown a lot in the past 15 years, and it's because the city itself has grown," Foster says. "People aren't looking for chains; they don't want cookie cutter. We've all been forced to get better at what we do." Foster champions many of the menu's items, but admits to a particular fondness for the Foxing Fried Chicken. Over at Smalls (1609 Elizabeth Ave.; 704-334-8338), fried chicken is also playing a starring role. If I'd told owner Joseph DiLeo that a friend described their chicken and waffles, served with salted caramel butter and chili-infused honey, as "an explosion of flavor," he might have been happy to hear it, but not necessarily surprised. "We [with Chef Zack Gadberry] really wanted a menu that was accessible to everyone," he explains. "We identified our 40 favorite things and we did recipe tasting for about a month to create an environment where every dish was addictive. If it wasn't an addictive plate, we weren't going to serve it." DiLeo, a recent Rochester, N.Y., transplant, is a man of strong convictions. Addressing the decision to only serve North Carolina craft beers, he says "the reason we did it is really twofold. It's a better product, and it supports local entrepreneurs. Anheuser-Busch has enough money. I'm a lifelong entrepreneur, and I understand what it's like to fund your dreams on your credit cards." He also makes it a mission to bring in an audience for the best local entertainment he can book, Thursday through Saturday nights. "If you like local, you have to support local, or local goes away," he says. "Now is the time for entrepreneurs to make their mark in Charlotte, and now is the time for Charlotte to make its mark."